This statement is not the current outlook in 2010, rather the look forward from 1990. The above quote is from the report “Health Sciences at Minnesota: A Look Back and a Look Ahead” (Sept. 1990). 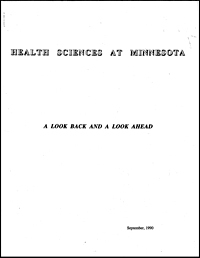 It documents the administrative history of the AHC during its first twenty years and describes the changes in both the health needs of the state of Minnesota and teaching health care in higher education. This year marks the 40th anniversary of the Academic Health Center. Documents such as this help identify the AHC’s passage over time and allow readers to place historical mile markers along the way of its development. While reading this report, certainly many will consider 1990 as the recent past and 1970 less so. Yet, today the AHC is different than it was in 1990. In fact the AHC of 1990 is much closer in structure and governance to its earlier self of 1970. As it looks far forward into the future, the report tries to imagine how individuals will get their health information in the year 2000. The role of personal computers, self-care, and prevention strategies are all forecasted. In many ways, the later part of twentieth century focused on what promises the twentieth first century would bring. This report is one such document. Unlike some of the preceding forecasts of the future of health sciences, this review of challenges and opportunities is on trajectory to intersect with its future to create a present that has now become our past. Read the report in full below. Unfortunately, the listed attachments were not saved. In the February 13, 1939 issue of Time Magazine, an article described the plight of Jewish physicians in Germany. The Nazi government revoked their licenses and asked many to leave the country all together. The response in the United States included a fear by some that emigrating physicians would compete with U.S. doctors while others created support networks to find homes for their European counterparts. During the spring of 1939, Dr. John L. McKelvey received notice from Germany that his colleague and mentor, Dr. Robert O. Meyer, would soon become one of the displaced. Dr. McKelvey, who became the first full-time department head for obstetrics and gynecology the previous year, set out to secure Dr. Meyer a position at the University of Minnesota. Dr. Meyer, a world renowned pathologist, had a full career in Germany. In 1935, at the age of seventy-one, the Nazi government relieved him of his position at his university. With support of his colleagues he remained unofficially on staff and continued to conduct research and collect consultation fees. In December of 1938 the Nazi Ministry of the Interior informed him he would no longer be able to remain in Germany. By the end of May 1939, Dr. McKelvey secured approval from Dean Diehl and President Ford as well as the Board of Regents to send an official letter of offer to Dr. Meyer. Funding for the position came from a variety of sources. The primary source was the Emergency Committee in Aid of Displaced Foreign Medical Scientists (New York) who provided $1,500 per year for two years. The American Gynecological Society and its members provided $1,309. The Manhattan Research Foundation provided $500. Various friends and associates raised $648. Additional funds raised from lectureship fees added to the overall amount needed to fund his research position. The total of this revenue established the Robert Meyer Clinical Associate Professorship Fund in Obstetrics and Gynecology at the University of Minnesota. On September 1, 1939, Dr. Meyer, then seventy-five years old, and his wife planned to fly out of Berlin but could not due to the Nazi invasion of Poland. Instead, they took a train to the Netherlands to meet their ship to the U.S. After a brief stay in New York, they arrived in Minneapolis on September 21. From 1939 until 1947 Dr. Meyer actively participated in the Department of Obstetrics and Gynecology as a researcher. He also worked with the Minnesota State Board of Health as a part-time obstetrics pathologist with their home deliver training. Dr. Meyer passed away at the age of eighty-three in 1947 after having retired from the University of Minnesota in June. Before he died he wrote the Autobiography of Dr. Robert Meyer: A Short Abstract of a Long Life serialized in the Journal of the History of Medicine and Allied Sciences. 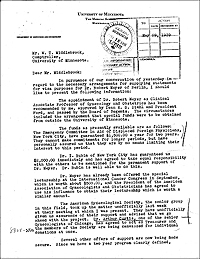 Several documents related to the establishment of the Robert Meyer Fund and Dr. McKelvey’s letter offering Dr. Meyer the position at the University of Minnesota are available below. Soft drinks rarely get positive marks for health benefits. In fact soda consumption is linked to increase risks of diabetes, cardiovascular disease, tooth decay, obesity, and most recently pancreatic cancer according to a recent University of Minnesota study. But have soft drinks taken the blame for diseases without any clearly linked evidence? Internet rumors include carbon dioxide poisoning due to over consumption and deaths resulting from mixing soda and certain candies that create a combustible combination. Yet, targeting soft drinks is not a new phenomenon. In the late 1940s polio continued to elude researchers and their ability to isolate the virus and create an effective vaccine. At the University of Minnesota a team of medical scientists funded by the National Foundation for Infantile Paralysis (now March of Dimes) worked to better understand the disease and search for treatments and a cure. This group known as the Minnesota Poliomyelitis Research Committee included such notables as Ancel Keys (physiological hygiene), Cecil Watson (medicine), Elexious T. Bell (pathology), Ernst Gellhorn (neurophysiology), Irvine McQuarrie (pediatrics), Raymond Bieter (pharmacology), Gaylord Anderson (public health), Berry Campbell (anatomy), A.B. Baker (neurology), and Maurice Visscher (physiology) as its chair. The committee’s focus on such a widely feared and often misunderstood disease resulted in a deep public interest in their progress. Letters to the committee offering advice, theories, and potential solutions were common. 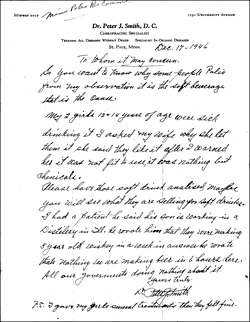 Suggestions received included dropping DDT on the city of Minneapolis by airplane to kill the virus,looking at the public health menace of dog feces in yards and parks as a transmitter of the virus, and recognizing the unfettered spread of world capitalism as a proponent of the disease (this letter also included a card to join the Socialist Party).